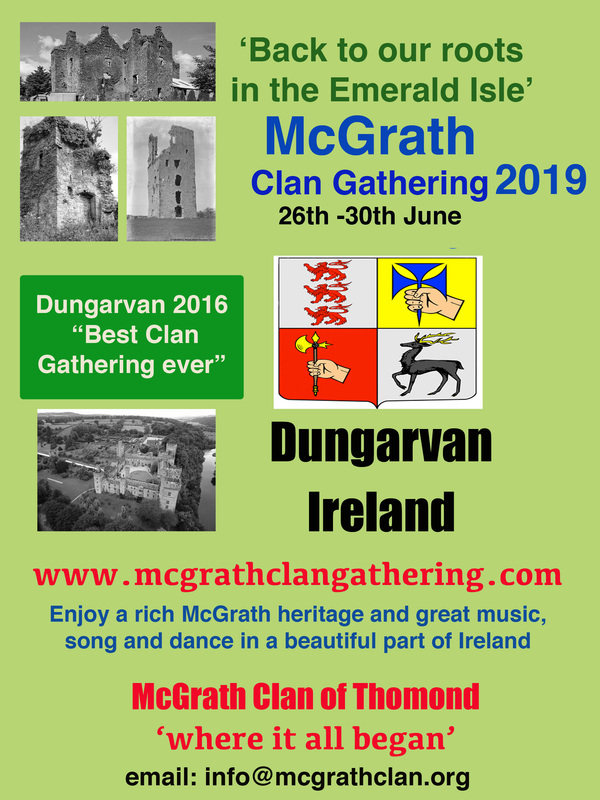 It just over 4 months to International McGrath Clan Gathering in Dungarvan, Co Waterford. This five day festival of McGrath heritage, history and culture has attracted members of the clan from around the world. The gathering starts on Wednesday, June 26th and continues to Sunday, June 30th, culminating in the McGrath Gala Dinner in the Park Hotel. It features two heritage tours, three lecture sessions, BBQ, great Traditional Irish Music, Gala Dinner and film premiere. Due to the popularity of the host town, early booking is advised. The organizing committee wish to announce the addition of Dennis Wright to our line up of speakers for June’s McGrath Clan Gatherig in Dungarvan. .
Dennis Wright will be speaking on the subject ‘McGrath and Dál gCais Origins’. This will be of particular interest to anyone interest in DNA. Dennis was born in New Zealand and his interest in Genealogy began over 40 years ago following up family stories which led him back on his maternal side to Robert the Bruce, Scottish, English and ultimately European Royalty. He even found a line going back to Brian Boru. On his paternal side, however, he has battled against an early 19th-century brick wall in New Zealand for some 40 years. In 2005, it was suggested that DNA testing may help him breakthrough and indeed it did. But to his surprise, he found his paternal ancestry was Irish, not English as his name would suggest. Dennis administers the FTDNA R-L226 Project and has maintained a DNA website for this Irish cluster. He authored a paper in the Spring 2009 edition Journal of Genetic Genealogy, entitled “A Set of Distinctive Markers Defines a Y-STR Signature for Gaelic Dalcassian Families”. Dennis is a past member of the Australian Institute of Genealogical Studies, New Zealand Society of Genealogists and Hampshire Genealogical Society. He is the ISOGG Australian Regional Coordinator. He has a huge interest in the Dal Cais DNA and is regarded as one of the foremost authorities on the subject. Due to the McGrath Clan being of Dal Cais origin, it’s very appropriate that Dennis is speaking at the Clan Gathering. This entry was posted in Uncategorized on February 26, 2019 by McGrath Clan (official). trip on the Lakes of Killarney, O’Connor Pass, Dingle and Cork. heritage sites along the way. Please email info@mcgrathclan.org to express your interest in joining this tour! This entry was posted in Uncategorized on January 22, 2019 by McGrath Clan (official). The McGrath Clan Association are delighted to announce the Liam McGrath Memorial Research Bursary in honour of a man who carried out a huge amount of research into our clan and generously shared his findings with us. The research subject will be on the Mac Craith Bardic School which was located just outside Cahir in Co Tipperary and will be presented to clan members at the McGrath Clan Gathering next June in Dungarvan. Clan member Caroline Smiddy is the recipient of the inaugural bursary. This entry was posted in Uncategorized on December 31, 2018 by McGrath Clan (official). It’s that time of year when we look back on the previous 12 months and look forward to a New Year. It’s a time of goodwill and a season where we share precious time with our family and friends. Across the many years and miles that separate us, our common Irish heritage brings us closer together. As we reflect back, I would like to praise and thank each and everyone who helped promote our clan in any way. The flag for the 2019 McGrath Clan Gathering has been in North America, New Zealand, and Australia this year and is currently in South Africa. Each of the hosts has to be commended for their help. Looking forward, we have an important event in 2019 and I, as Chieftain of the Clan McGrath (Thomond) and Chairman of the McGrath Clan Association/Cumman Clann Mhic Craith, hope to welcome many of you to the International McGrath Clan Gathering in the beautiful coastal town of Dungarvan on Ireland’s south-east coast. It will truly be a special event for all the McGrath Clan. We also need to remember those who are no longer with us. They may be gone but they are not forgotten and are still very much in our thoughts. I want to wish each and every one of you, wherever you may be, a very happy Christmas and a prosperous New Year. Nollaig Shona agus Athbhliain faoi Mhaise Duit. An Irish man living in South Africa, John McGrath is the 2018 recipient of the ‘Medal of Echthighern’, the highest honour which the McGrath Clan can bestow on an individual. The award was renamed last year, the ‘Medal of Etchtighern’, which was the name of the brother of Brian Boru, from whom the McGrath Clan descended. The McGrath Clan get their name from Echthighern’s grandson Craith( Mac Craith is the Irish/Gaelige for McGrath). Since 2013, the Clan McGrath of Thomond, the original McGrath Clan, have recognized several individuals for their contribution and enhancement of the McGrath name. All have brought great credit to the McGrath name. John will receive the award at next year’s McGrath Clan Gala Dinner in Dungarvan. From Knockanore, Co Waterford, John is a former international rower who wore the green vest of Ireland with distinction. He went onto create a career in martial arts and is a strongman world record holder. During his sporting career, he took up coaching and is now one of the top fitness coaches in the business. He is attributed with the giving South African World Champion Luvo Manyonga, the talented long jumper a second chance, which saw him claim silver in Rio and gold at the world championships. He is also a highly respected motivational speaker and has a TV slot in South Africa. However, John will be best remembered in the annals of the McGrath Clan for his work in organizing clan gatherings at the turn of the century. His drive and enthusiasm saw the clan gathering becoming a reality. Clan McGrath Chieftain Dan McGrath, who took up the mantle of organizing Clan Gatherings from John, said that, “we will be eternally grateful for his vision and unselfish dedication to our clan”. The International McGrath Clan Association/McGrath Clan (Thomond) wish to acknowledge the contribution of Clan members to society. This comes in many guises, some play an important leadership role, more give up of their time to carry out research, others do voluntary work and help those in need. You also have individuals who have performed at the highest level in their chosen field. Some have carved out a career in the arts world. We are fortunate to have so many talented individuals in our clan. Dan Patrick McGrath, California, USA, was the 2017 recipient of the ‘Medal of Echthighern’.